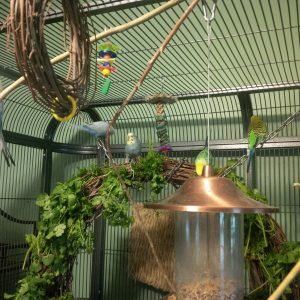 Marden's Ark Avian Refuge > News > Healthy Food > Help! My bird won’t eat fresh foods! We hear this quite often from those who have tried feeding fresh food only to have it completely ignored. Our first answer is: “Don’t give up!” Persistence is important, but probably even more important is analyzing how you are presenting the fresh food to your feathered picky eater. So maybe you watched a video on how to make “chop” and you bought a huge variety of gorgeous produce and spent an afternoon dicing and chopping and mixing and adding ingredients until you had an entire freezer full of single-serve packages of ready-to-thaw-and-serve fresh goodness! Alas, upon serving the first bowl, not much interest was shown. Or perhaps the food was accepted the first time, but when that next bag came out of the freezer, it was met with disdain. This is actually what we went through with Megan, costing us several batches of “chop” before we came to the conclusion that it was better for us to make it up fresh a week at a time and never freeze it. 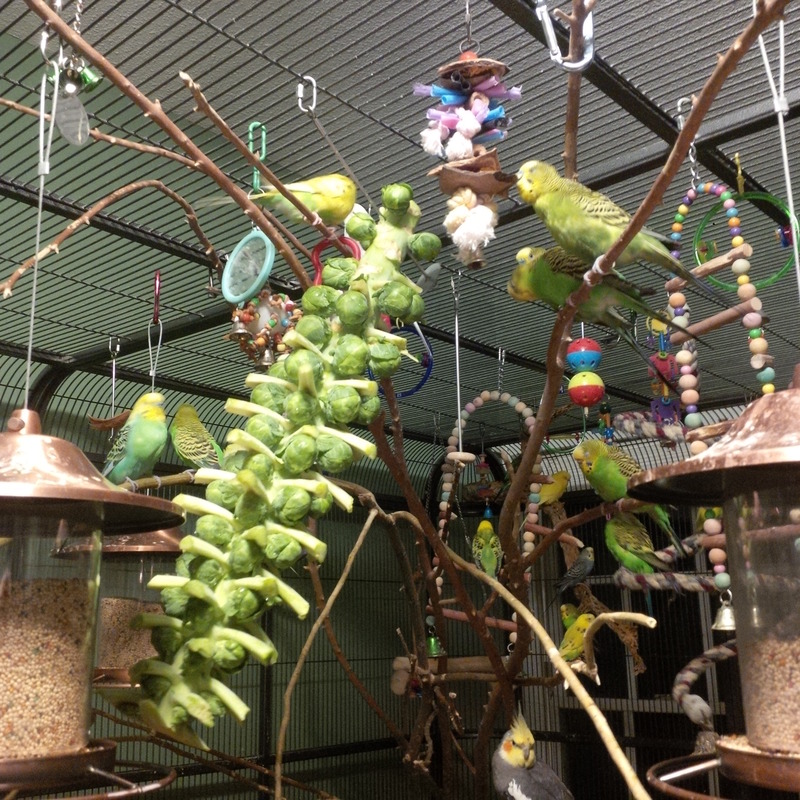 The wreath in the aviary comes alive with fresh, living greens. Marden had no problems accepting new menu items. He never met a food he didn’t like and approached every offering with great delight and enjoyment. His mother, Ife, is the same way. And following her lead, her mate Adom tries whatever he sees her eat. Social eating is part of being a flock and in the wild that’s how the young birds learn what is safe and what is not. If you see another flock member eating it, and they aren’t dropping off their perch, then obviously it’s not poison, right? 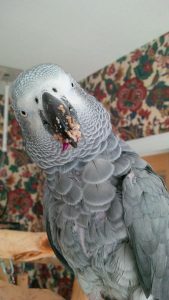 This behavior is important because you can often get your bird to try new things by joining them in a meal and eating the healthy food with them. By sharing a dish of fresh, healthy food, you are showing them that the food is safe for them. We all know how our birds are obsessed with sampling whatever they see us enjoying when it comes to eating our own food. It’s because they are social eaters and if we are eating something, they are naturally inclined to want to join in. This sets up a perfect opportunity for getting them to try those new foods. 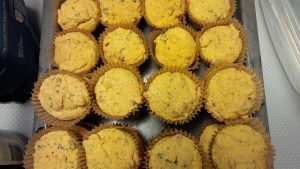 These muffins contain not only healthy grains like flaxseed and quinoa, but they also contain an array of chopped fresh peppers – sweet bell along with hot varieties! Think outside the bowl. You don’t have to chop, slice and dice that broccoli, or those Brussels sprouts. Hang them, instead! That bell pepper can be skewered and stuffed with other goodies for foraging fun. Hang items in wire baskets, place whole squash or small pumpkins in a large dish or tray and watch the messy fun begin. Grapevine wreaths make excellent places to hang greens or veggies for foraging opportunities. 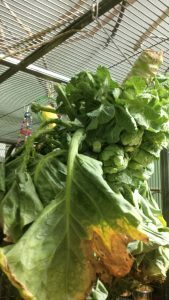 An entire stalk of Brussels sprouts hangs in the aviary. In a matter of days, there will be nothing but a bare stick left. If your bird doesn’t like a food one day, they may eat it the next. Birds’ tastes can change quickly. Remember that in the wild, they must move quickly between food sources, and what was available yesterday may or may not be available today. So like wild birds, our companions are wired to eat in season, following the crops that are available at given times. This means they may crave something this week, but next week it’s time to move on to something else. 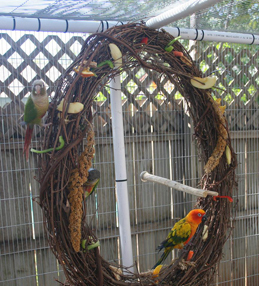 Conures foraging on the “wreath of plenty” strung with fresh veggies, fruits and millet sprays. More to come… stay tuned!.